I'm still trying to use up the zucchini from my garden, so I thought I'd make another soup to put in the freezer for the school year. This is a great low-fat one. My husband jokes that this one should be called "cholorphyll soup" because of the bright green color. 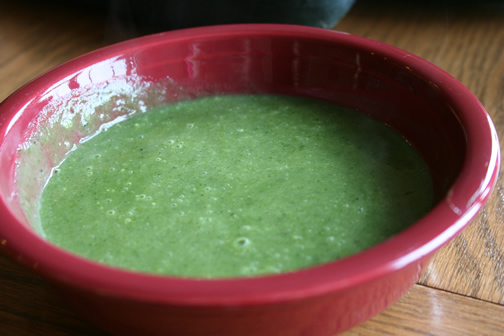 :) You do have to like spinach to enjoy this soup. I probably prefer my zucchini bisque recipe to this one, but they are very different. In a soup pot, heat oil and add onions. Cook until tender. Add garlic, zucchini and potatoes. Cook over medium heat for about 5-8 minutes. Add stock. Cover and simmer until potatoes are tender, around 30 minutes. Add spinach, cook another 15 minutes. Season to taste. Glad you liked this. I do too. It is so creamy and delicious. I love soups like this. This is one great soup, easy to make and yummy to eat.